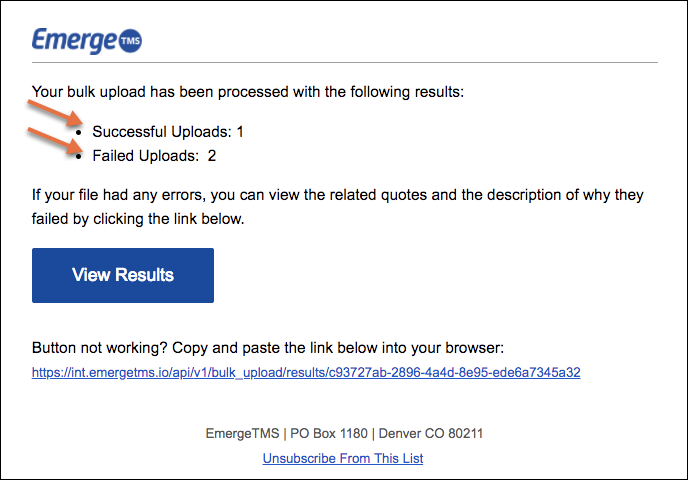 For Emerge to send quotes to your partners, use the last two columns in the template. Notify All Partners: This runs off of a True or False statement. If you enter TRUE, Emerge will automatically send the quote to your entire partner network. If you want the quote to go only to select partners, enter FALSE. Notify Select Partners: This column uses Partner Tags to choose which partners receive the quote. For example: if you have previously tagged partners with "East Coast" you could enter that tag into the "Tags for Partners Notification" column to send quotes to those select partners. Protip: Multiple tags can be used and must be separated by a comma. Please note tags in this column are based on an 'and' statement, not an 'or' statement. Therefore, if you were to enter "East Coast, Van", quotes will ONLY be sent to Network Partners previously tagged with 'East Coast' AND 'Van' tags.